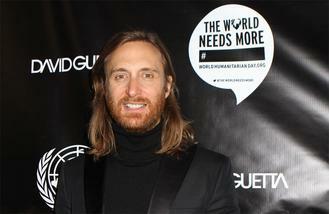 David Guetta and Run-DMC will co-headline the Isle of Wight Festival on Friday June 9. The superstar DJ and the legendary hip-hop outfit - comprised of Joseph 'Run' Simmons and Darryl 'D.M.C.' McDaniels - will take to the main stage at the music extravaganza held at Seaclose Park in Newport, Isle of Wight. Bastille, Rag 'n' Bone Man, George Ezra and Jack Savoretti have also joined the line-up, which already includes headliners Sir Rod Stewart and Arcade Fire. Commenting on their headline slot, Run-DMC's Joseph Simmons said: "We absolutely love playing the UK, it's always been such a great reception. You guys rock! "To be given the chance to play such an iconic UK festival is huge and we're really looking forward to it." And festival organiser John Giddings added: "The Isle of Wight Festival has always been known for its variety in music and this year is no different. To have the world's first and most inspiring hip hop group headlining alongside one of the world's biggest electronic DJ's is fantastic. "I'm also really excited about George Ezra, Rag 'N' Bone Man, Bastille and Jack Savoretti. Again there's something for everyone. "I know the crowds at the festival are going wild for all the acts, not just the headliners." Last year's festival was a triumph with musical legends Queen + Adam Lambert, The Who, Iggy Pop and many more gracing the main stage. With the final headlining acts announced rumours that Guns N' Roses, Beyonce, Coldplay and Green Day were set to perform have been put to bed. Over the years Isle of Wight Festival has seen a whole host of legendary acts perform including The Rolling Stones, Bon Jovi, Fleetwood Mac, David Bowie, The Killers and Sir Paul McCartney. Early Bird tickets are on sale now. Zayn Malik has credited girlfriend Gigi Hadid for fuelling his collaboration with Taylor Swift. Singer Robin Thicke has paid tribute to his father, actor Alan Thicke, following his sudden death on Tuesday (13Dec16). AC/DC are to release a new book documenting their recent 'Rock or Bust' world tour. Sting and Trudie Styler are set to become grandparents next month (Jan17). Kate Moss stars in a new Elvis Presley music video for his song, For The Wonder of You. Singer Adele has picked up the album of the year title for 25 at the BBC Music Awards. The Weeknd wants his live performances to "feel like opera". Adele was the big winner at the BBC Music Awards on Monday evening (12.12.16). David Beckham insists his 11-year-old son Cruz's pop career will always take a back seat to his education.